Diego Costa continued his seamless introduction to the Barclays Premier League with his second goal in a week as Chelsea beat Leicester City 2-0. Jose Mourinho's title hopefuls turned in a dazzling display to beat Burnley 3-1 in their opening fixture, with the Spain forward starring, but they found another newly promoted team a tougher nut to crack at Stamford Bridge. Home goalkeeper Thibaut Courtois was every bit as busy as his Leicester counterpart Kasper Schmeichel during the opening hour, with David Nugent’s failure to capitalise on a 55th-minute opening, when one-on-one with the Belgium goalkeeper, particularly costly for the visitors. After a low-key first half, Mourinho's decision to push his full-backs forward after the interval paid dividends, with Branislav Ivanovic creating a scruffy 63rd-minute goal for Costa to break the deadlock. 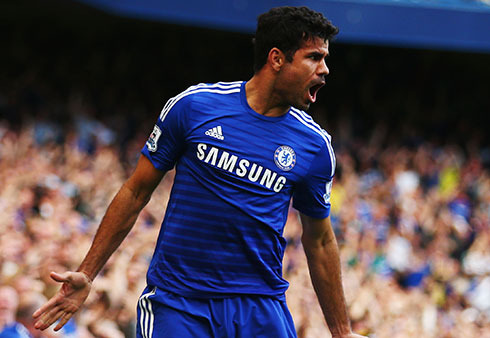 It continued the flying start to his Chelsea career after arriving from Atletico Madrid. Eden Hazard again showed his class with a solo effort to seal the points, netting the second with 13 minutes left to seal the points. Swansea City maintained their winning start to the Barclays Premier League season with a 1-0 victory over Burnley at the Liberty Stadium. Mauro Zarate scored on his debut as West Ham United inflicted a second consecutive defeat on Crystal Palace by securing a 3-1 win at Selhurst Park. The impressive Zarate was brought into the starting line-up in the absence of injured captain Kevin Nolan and made the most of his opportunity by firing Sam Allardyce's side in front with a sublime volley in an eye-catching display. Arsene Wenger praised Arsenal's character as they battled back from a goal down to secure a 2-2 draw with two late goals at Everton on Saturday. In April, Arsenal were soundly beaten 3-0 on Merseyside, and on the back of their European exertions at Besiktas in midweek, the north London side looked set for a repeat as Everton raced into a 2-0 half-time lead thanks to goals from Seamus Coleman and Steven Naismith. But Wenger's men worked their way back into the game, as Aaron Ramsey continued his rich vein of scoring form to reduce the arrears in the 83rd minute and then Olivier Giroud headed them level in the final minute. Southampton and West Bromwich Albion shared the spoils at St Mary's Stadium after a goalless draw of few chances. Both sides had cause for optimism going into the clash, Ronald Koeman's men impressing in defeat against Liverpool and Alan Irvine's charges only denied three points by a late Sebastian Larsson goal for Sunderland on the opening weekend. However, neither side did enough to deserve three points on the south coast in a tight affair as Koeman and Irvine continue to await their first top-flight triumph. In the early match, a late save by Brad Guzan denied Newcastle United their first win of the season in the Barclays Premier League as they and Aston Villa scrapped their way to a 0-0 draw at Villa Park. Newcastle had not mustered a shot on target in their 2-0 defeat by Manchester City last weekend, and Alan Pardew's men again struggled to create many clear chances in the first half. Saturdays' results: Chelsea 2-0 Leicester City, Crystal Palace 1-3 West Ham United,Southampton 0-0 West Brom,Swansea 1-0 Burnley.